I’m sure you all have noticed that I’ve mentioned Oprah several times in this blog. While she openly admits she doesn’t like yoga, I do consider her one of my first spiritual teachers because I’ve watched her show since I was in college. Back then some of her material didn’t resonate as much with me as it has in recent years and lately I’ve wondered what, if anything, I might have jotted down back then. So I started a project to organize and consolidate the notes I’ve taken over the years (yes, I’m that nerdy). Now, I really thought I would find therapy-like scribbles on psychological stuff about dysfunctional families, books she recommended, or just quotes; nothing earth shattering. Well, smack me upside the head because this journey is full of surprises! I have a pretty good memory but I gasped when I saw that I was looking to be a better person all the way back in 2007? My first thought was, it’s taken you 5 years to be in the exact same place? What the heck is wrong with you? So I went to my journals and really thought about what my life was like back then: I was in a predatory, cut-throat corporate environment, working insane hours and traveling across the U.S. Apparently, I did try to incorporate kindness, compassion, and patience into my everyday life but advertising is a nasty business. Everyone yells at each other, impatience is an epidemic, unconscious egos run amuck, and gratitude and appreciation are scarce. None of my friends or family were on a spiritual path. I was by myself like a twig in a hurricane. So after a few months of trying I gave up, surrendering to fighting back with similar tactics to protect myself. If there was ever a “Fear Factor” competition for the Dalai Lama, it would be to stick him in advertising. How long would he last after being relentlessly screamed at hour after hour, day after day, pulled off center with a barrage of passive-aggressive belittling comments and having to exist in a reactionary mode with no time for meditation or reflection? But he’s the Dalai Lama because his environment as a Buddhist monk supports his nature and the principles he chooses to live by. He was nurtured by others and his surroundings helped him grow into who he is. The rest of us don’t have it that easy. Especially for those of us who are new to raising our conscious awareness and working to instill spiritual principles, we need our environments to support us in our infancy stage. So, I can find some forgiveness for myself because five years ago, I was overly ambitious and really didn’t have the facilities to make that kind of change. I was trying to grow an orchid in the middle of the Mohave desert. Clearly, not the right environment for that seed to grow. But I know the desire is in my nature, in my essence, because I’ve still been seeking it for all these years. In fact because I was beaten to a pulp by that lifestyle, that’s why I finally found yoga in the winter of 2008 and then began to practice with Marco in the spring of 2009 and have subsequently met many other friends who share the goals I do. Now I have the support system to enact the change. What I wanted is coming to fruition and for that I will be grateful. In practicing compassion, fairness, and objectivity toward ourselves, we must be realistic and scrutinize our alignment with the right environment. 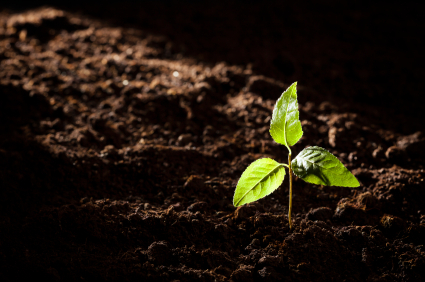 When planting the seeds for our future, we have to look at the soil. Is what we’re surrounding ourselves with nourishing our goals or poisoning them? Entry filed under: Beginnings, Creating Awareness, Imprints, Intention, Patience. Tags: Awareness, Judgement, Lifestyle, Mindfulness, Oprah, Practicing non-judgement, Spirituality, Sri Swami Satchidananda, Suffering, Yoga Sutras. I collect notes too, but haven’t taken the time like you to consolidate them. This is extremely true. I was working in a job that was making me bitter and miserable and someone told me, “You can’t be depressed about things that you can change.” That statement changed my life. If your environment and the people around you are stifling your path, it’s time to move on like you did. As a side note, Oprah was definitely my first spiritual teacher as well! Thank you so, so much Cathie!!!! I’m super thrilled!!! Best wishes to you….